Went back to the White River again today. The brown trout fishing was great. 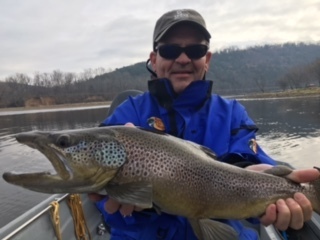 We put 17 browns in the boat today most of them were 19 to 21" but we got one good one. I put in at Gastons again and fished my way to the White Hole. We were drifting the minnows with a small split shot for a sinker. The bite was better before the sun came out around noon. After the sun came out the wind picked up. The wind will set you back when trying to drift on the low water. Headed to Wildcat tomorrow with a couple guys that have made the trip from West Texas four years in a row now. The first year it was in the low teens and even single digits one morning but they landed a 13lb.5oz one day then a 13lb.12oz the next day. Last year they got a 14lb.2oz. Lucky guys I cant wait to see what happens the next three days.